FYI: Info on this page is for the benefit of families and supporters of Koh Samui Prison inmates. Visiting Times: Samui Prison visiting days are Monday to Friday, closed weekends. Morning visits are 9 am-12 noon for sentenced inmates only, and afternoon visits are 1 pm to 3 pm for inmates who are not yet sentenced. Check in by 8.30 am for morning visits, 12.30 pm for afternoon visits. Check In: You will need your passport or photo ID, and the inmate's name. If you have their surname and prison number, that's great, but it is possible to visit with a first name only. Wear respectable clothes, as you would do to any government office. At the rear of the main waiting room is a desk manned by two 'Blue Shirt' trustees. They themselves are prisoners who will soon be released; they are civil, but not friendly. They have a job to do, and they take it seriously. * Procedures at the prison change regularly. You now check in at the counter on the right - next to the window where you can deposit funds. 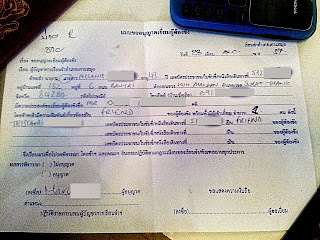 1) YOUR name, age and passport no. 2) INMATE'S name and your relationship to them. 3) Any other VISITORS? Their name, passport and relationship. Hand this form in to the Blue Shirt Trustees at the window. Wait for them to process it and call you to the front to show your passport/ID. The trustees will give you a colour coded number. This is your visit number. Deposit funds: Once you have your colour coded number, you can queue up at the next window and deposit funds into your inmate's account. Even if you can only spare 100 baht, it could buy them a couple of meals for the day. The prison guard behind this counter on the right is gruff: show your respect. No loud voices, smiles and wais go a long way! Repeat your inmate's name slowly and clearly so the guard can understand your accent. He will issue you a receipt. * The guard has changed now, he's younger and slightly more friendly, but still quite confused by us farang. Speak slowly and keep smiling! NB: As of July 2014 you can no longer deposit food or books brought from outside. You can only deposit funds for prisoners into their prison account, which they can spend at the improved prison canteen to buy themselves food and supplies. Visit Prisoner: Now lock your belongings in the lockers behind the check-in desk. Ask the Blue Shirts for a key, they will keep your passport. Line up by the gate and wait for the prisoners to file in. When everyone is there, the Blue Shirts will call your name. Head down the corridor, and follow your prisoner to a visiting booth. There is a glass screen dividing you. Pick up the phone and say hello! You have about 15mins to exchange stories and give an inmate a visit to smile about. Good luck! After, pick up your passport and stop to buy water and prison supplies at the counter. Then head to the outside waiting area to buy fruit. The lady behind the desk here has a list of fruit which will be taken straight to the inmates. See posts below for details! Moral Support: What's My Story? 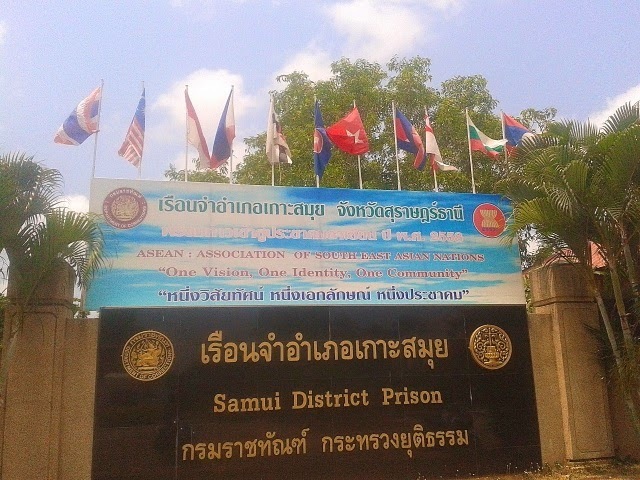 Directions: Koh Samui Prison is on the ring road between Lamai and Na Thon. Follow the prison sign and turn off the main ring road, then continue 1.5km down a winding country lane. The Remand Court & Prison are on the left. Go past the court buildings and drive straight through the guard box. You will see Samui District Prison (photo above) right in front of you.